You want to start a blog but feel overwhelmed. You’ve read countless articles and done a ton of research. What to focus on? Where to even begin? You feel like you’re failing before you even get started! The key to any difficult or ambitious goal is to break it down into smaller, easier steps. And this is true of starting a money-making blog. In the following guide, we’re going to show you how to overcome the overwhelm. We’ll follow a proven, step-by step blueprint for starting a profitable blog – and in less time than you’d think. Join us as we start our journey with the all-important first step: understanding your WHY! It might be difficult to pinpoint why we’re helplessly addicted to binge-watching. Fortunately, the reasons for starting a blog are much clearer! Make money working from home. Are you type of person who leaps out of bed each morning, excited about rush hour traffic, condescending bosses, trading time for money and helping make someone else rich? If so, you should probably stop reading this and close the browser tab. For everyone else, blogging can start off making you a side income and eventually job-replacing money! Build an audience. No matter what stage you’re at with your side-gig or business, being able to reach people at very little cost is a good thing. Done correctly, blogging will help create more traffic, build your email list and ultimately increase your customer conversion rates (more sales)! Establish yourself as an expert. 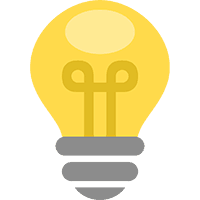 A blog is an ideal place to develop your thoughts around a particular topic. With time and consistency, you’ll establish trust and influence in your industry… making yourself into an authority or thought-leader. This will help you stand out amongst the competition and open new doors of opportunity. Creative outlet/inspire others. No matter where your interests lie, blogging gives you a platform for expressing yourself and connecting with other like-minded individuals. It’s a place where you can just write, share your story, encourage others or build awareness around a particular topic. Do any of these reasons resonate with you? Do you know your own why(s)? If so, let’s pull the curtains back a little further. Let’s see what it actually takes to start a blog. The following is an overview of the topics we’ll cover in this guide. Each section is organized in a way that shows you the exact steps to follow to reach your goal. Complete each section and your new blog will be up and running in no time! Like any story, every blog has a beginning – and if you’re just beginning, you may wonder what to blog about. If you already have a topic in mind, that’s great! However, we still recommend reading this section to make sure it’s your BEST possible topic. There are many ways to get stuck. Let’s avoid all of them! 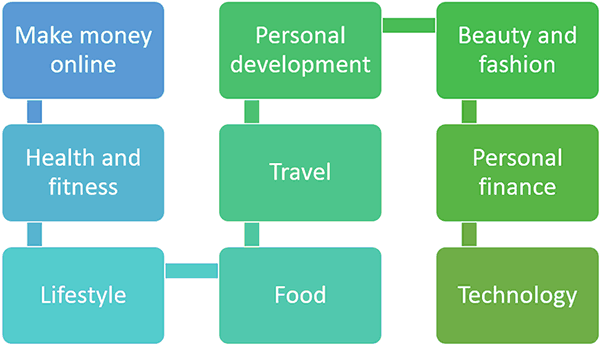 Picking your blogging topic seems like it should be simple yet so many people get stuck here. We’re talking days, weeks, or longer. Some people never make it beyond this point because of analysis paralysis. What helps is thinking about this process like a relationship. You aren’t getting married to your topic. Instead, it’s a date. If after several months you realize it’s not right for you, you can change things up by pivoting or choosing another topic. No worries. So with that in mind, let’s get started! If you’ve read other guides on starting a blog, you’ve probably noticed a lot of the same advice. It goes something like this: pick the topic you’re passionate about, an expert in, and then target a specific demographic. This is actually bad advice for a beginner. Passion. A topic you’re passionate about doesn’t always translate well into a business. For example, we’re passionate about eating pizza and watching movies. Solid biz foundation? Probably not. Also, a lot of people don’t even know what they’re truly passionate about. Instead, let your interests guide you… and success will create passion. Expert status. You do not have to be an expert. To repeat, you do NOT have to be an expert. You just have to know enough to help someone behind you. Given time, you’ll be able to help even more people and eventually become an expert. 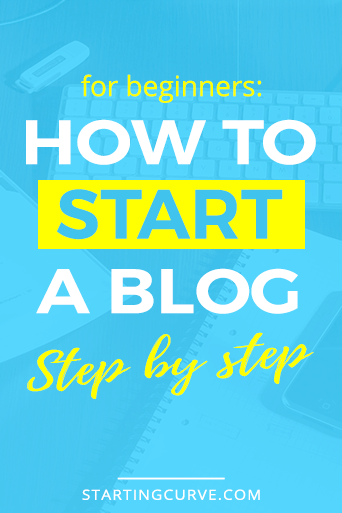 There are countless, successful bloggers out there who were new to their topic when they started. More on this below. Highly specific demographic. When you’re first starting off, you want to do quite the opposite. You want to cast a wide net. Things are going to be awkward in the beginning. You’ll fumble around a bit. It’ll take some time to understand your audience and their needs. In other words, it’s hard to know exactly where this blogging thing is going to end up, so you want to be careful not to pigeonhole yourself. By going wide at the start, you have room to play and explore different areas underneath that broader topic. Once you get a better understanding of your audience – and what you’re enjoying – you can then get more specific (if you choose). There will always be exceptions. The passion + expert + demographic formula can and sometimes does work. If you find that it fits you, go for it! However, be sure to read the section below for other considerations. 1. Genuine interest. Is this a topic you can enjoy? Do you have any interest in it at all? As a blogger, you’ll be writing within your topic for many years to come. If you really hate this niche, you’re going to make yourself miserable. Also, if every post is like pulling teeth, it’ll show in your writing. Your readers will sense this – and they will certainly not come back to read more. 2. Ability to help. Can you help people with this? You don’t need to be an expert. You DO need to be able to help solve your audiences’ problems – to some degree. If you are starting new in this niche, helping people can be as simple as sharing your journey, the things that you are learning and anything you wish you’d known at the start. If you do have some experience in this niche, then you’ll have many more options in how you can help others. But in the beginning, it’s only necessary to be able to help someone who is a few steps behind you. 3. Existing competition. Is there competition? Are there already a lot of blogs on this topic? If so, then good news! One of the best indicators of a strong, healthy market is competition. Why? Because a competitive niche is a proven money maker. If you are seeing a lot of competition, it almost always means there’s a lot of money to be made. If you see little competition, you can still find success but it will probably take longer. Our advice to you: if you don’t see a lot of competition in this niche, you had better do some research and figure out why. If you are looking to profit from your blog as quickly as possible, these are the niches we recommend exploring. Each has massive audiences with a proven track record for spending money. Congratulations! Now that you know your blog’s niche, it’s time to pick your domain name! Your domain name is like your street address. It’s how people know where to find your home. 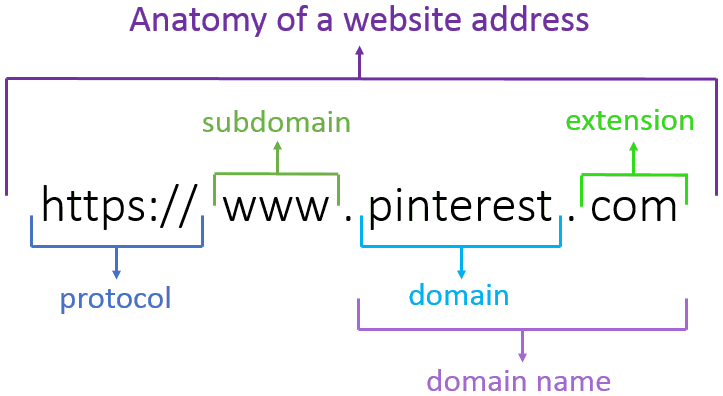 Choosing your domain name is another one of those beginner traps. Many will struggle and spend countless hours agonizing over the perfect domain name. It’s not as important as you think! Now don’t get us wrong. You shouldn’t just use any crappy name you think of on a whim. But consider this. In the blogging world, there are a lot of things you can get wrong and still find success. Get those right and you’ll be light-years ahead of the competition! If you are wanting to brand yourself as an expert in the future, you can consider using your name as the domain. This only works if your name is easy to spell, unique enough and available. Otherwise, spend some time thinking about your future plans with your blog. What kind of value will you offer your audience? What makes it unique? What kind of feeling or imagery do you want to conjure? If you had to describe your blog in just a few words, what would they be? Write these words down and then play around with combining them in different ways. Your domain name should give your audience some idea of what your blog is about in a short, memorable way. OK, so you’ve brainstormed some domain name ideas. Now what? Claim your domain, before someone else does! Your domain name is taken already. If those were stacks of dollar bills, it’d reach over 20-miles high! So, if your first handful of domain names are already taken, do not fret. It’s just part of the process. Limitations breed creativity. Let this be an opportunity to come up with something even more unique or memorable. If your domain is available, get a head start and click ORDER NOW. This will take you to our recommended host (spoiler alert: it’s SiteGround) with our preferred plan pre-selected. We also cover this in greater detail in Step 4 below. Your blogging platform is the software that runs your website. Using our home analogy, it’s like your type of housing – apartment, condo, duplex etc. That’s a crazy amount of websites! WordPress is completely open source. This means there isn’t a single company that owns it, so you don’t have to worry what to do if the company goes bankrupt. Open source also means less expensive, more transparent (fewer surprises), better security and higher quality. 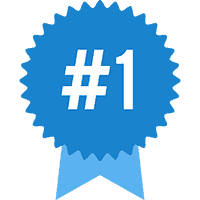 It has some of the best SEO (search engine optimization) straight out of the box. This means it plays nicely with search engines like Google and Bing. You can feel confident that the platform will do its part for helping your content become found. 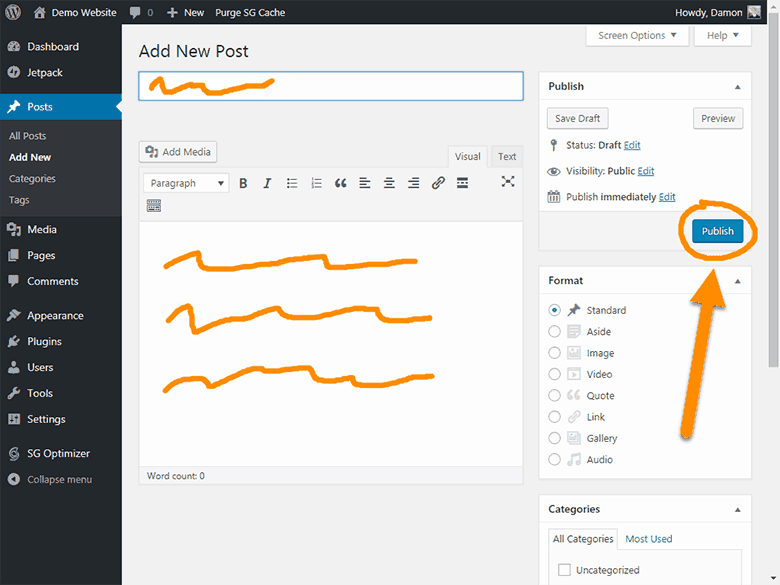 Saying WordPress is flexible and customizable would be a drastic understatement. Tens of thousands of plugins and themes exist today to extend its features and appearance in every way imaginable. If you can think it – then yes, there’s probably an “app” for it! WordPress has a huge, passionate and flourishing community of developers and enthusiasts. This following lends itself to the sharing of ideas and producing new and creative tools. It’s an exciting thing to be a part of! When you choose to use WordPress as your blogging platform, you have the choice of two options: hosted versus self-hosted. WordPress.com is the free, hosted as a service option. We don’t recommend this version because of severe limitations on customization, monetizing and SEO. It’s a backstep away from those benefits listed above. WordPress.org, on the other hand, is the flagship, self-hosted option that we’ll be talking about in this guide. Being self-hosted means you’ll have to pay a company to host the software for you (more on that below). However, it’s absolutely worth it because of the level of control you gain as well as the income potential. You’ve made it this far! Awesome job. Let’s keep the momentum going! The next step is to figure out where to build our home. If you wanted, you could download the WordPress software and install the blog onto your own computer. The problem is… the rest of the world won’t be able to see it. This is why we need a web host company. They make your blog visible to the world. 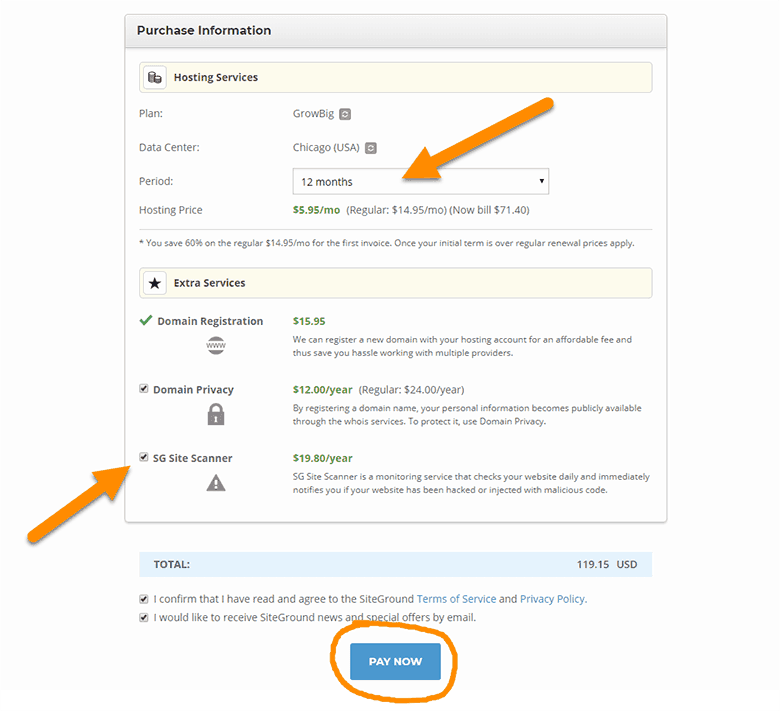 Your hosting company is like your landlord. You pay them rent so your blog can live on one of their computers. They take care of all the technical hardware stuff so you can focus on blogging! A web host typically costs in the $10-15/month range. You can get a huge discount if you pay for your first year in advance. This can bring your per month cost down as low as just $4/month. If you think about the high costs involved with starting a traditional brick and mortar type business, then you really begin to see how inexpensive starting an online business is. There are few legitimate businesses out there that could be started for less than a couple hundred bucks. 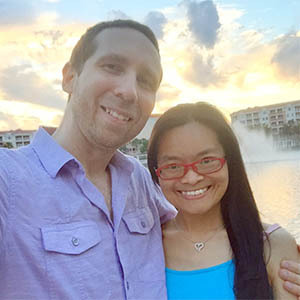 Let alone have the same full-time income earning potential as blogging! Support: If something happens to your blog, you don’t want to waste time trying to figure out how to fix it. An issue with your website can be embarrassing, cause you to miss out on new customers and ultimately cost you money. Great support should be available 24/7 to help you get everything back up and rolling. Reliability: What’s the point of having a web host if they’re constantly down? Uptime is the term companies use to refer to how long their computers were up and running without issue. It’s not uncommon to expect 99.99% from your hosting company. Speed: Google already considers your site speed in its ranking algorithm and others are likely to follow. But more important than SEO is your visitor’s experience. Consider this: how long will you spend on a blank webpage that’s taking forever to load? 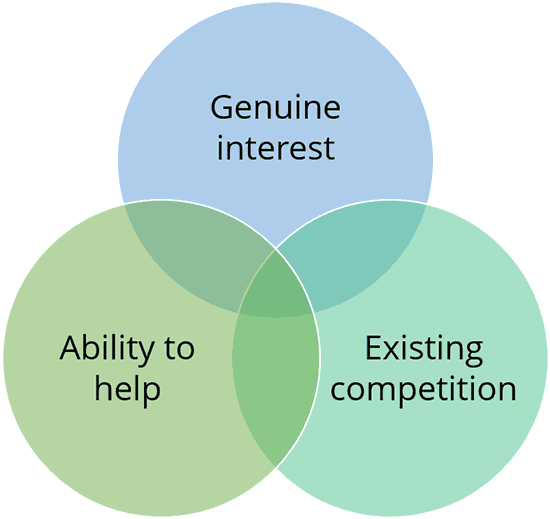 Exactly…..
Price: Collectively, these factors above create VALUE. Each person has to decide for themselves what it’s worth. Even if you’re just getting started, we don’t recommend going with the cheapest web host you can find. That’s setting yourself up for headaches and more headaches down the road. We’ve bounced around from a number of web hosts over the years, including… 1&1, DreamHost, FatCow, GoDaddy, HostMonster, HostGator, NameCheap, ServInt, Cloudways, our own hosting server, a long list of free web hosts, and probably some others we’re forgetting. Let’s look at SiteGround’s highlight reel and see why. SiteGround may appear ordinary and unassuming at first glance, but make no mistake – there’s a lot of power under that hood. Their servers are optimized specifically for WordPress which makes them fast and primed for your blog – right from the start! Their customer support is fast and knowledgeable too. Chat, phone and support tickets are available at all hours meaning you can rest assured – there’s someone around at 2:31 am to help you out. Everything is easy to use. Non-techies welcome! Moving from another web host but don’t know how? No problem. SiteGround can help move you. Hackers are a nuisance to everyone. Have peace of mind knowing SiteGround uses state of the art security to keep your websites safe and protected. If something bad DOES happen? SiteGround backs your websites up daily, so you’ll always have a backup to revert to in case something goes wrong. Everyone starts a business with growth and success in mind. SiteGround’s base level service is already fast and optimized but it also comes with a ton of room to grow (when you’re ready). Their plans include things most other hosts charge extra for… for example, unlimited SSL certificates, fast HTTP/2 enabled servers, 1-click CloudFlare CDN, server-side caching, speedy SSD drives, and more! They are one of the few hosts officially recommended by WordPress.org. 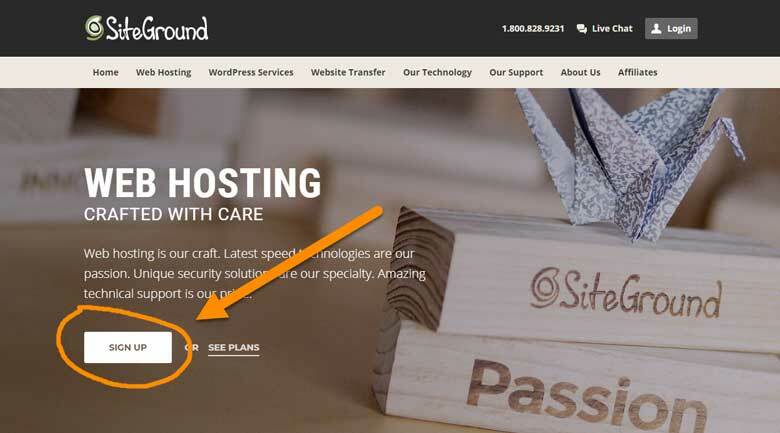 SiteGround has been in the hosting business for 14-years… which is an eternity on the internet. This sort of thing doesn’t happen by accident. There’s a pretty long list of web hosting companies that popped up, provided a lousy service and went out of business shortly afterward. You can feel confident that SiteGround’s experience level and state of the art equipment will take care of your hosting needs, freeing your mind to focus on developing your blogging business instead. This is how it should be! 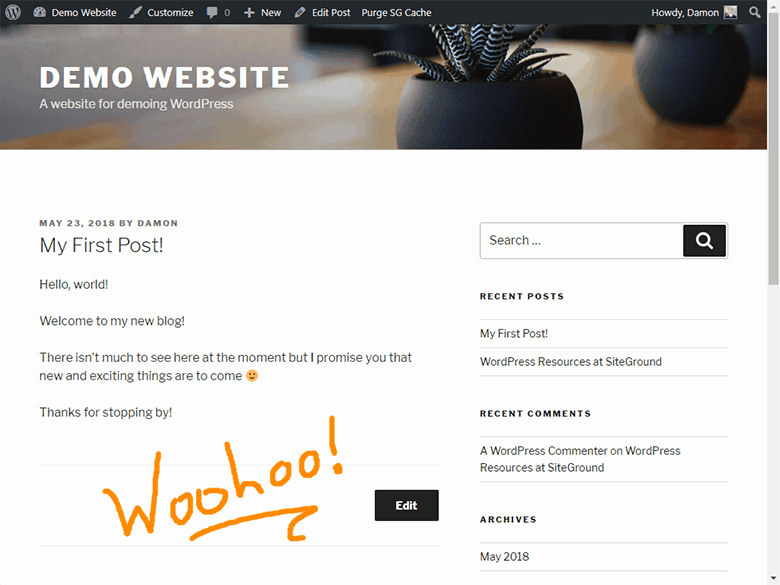 Click here to go to SiteGround and start your blog! (The link will open in a new window). 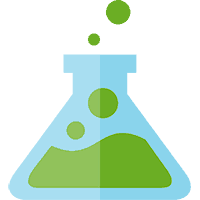 The link above will save you 65% or more on SiteGround hosting. This is their best promotion for 2019 and is automatically applied to your order. 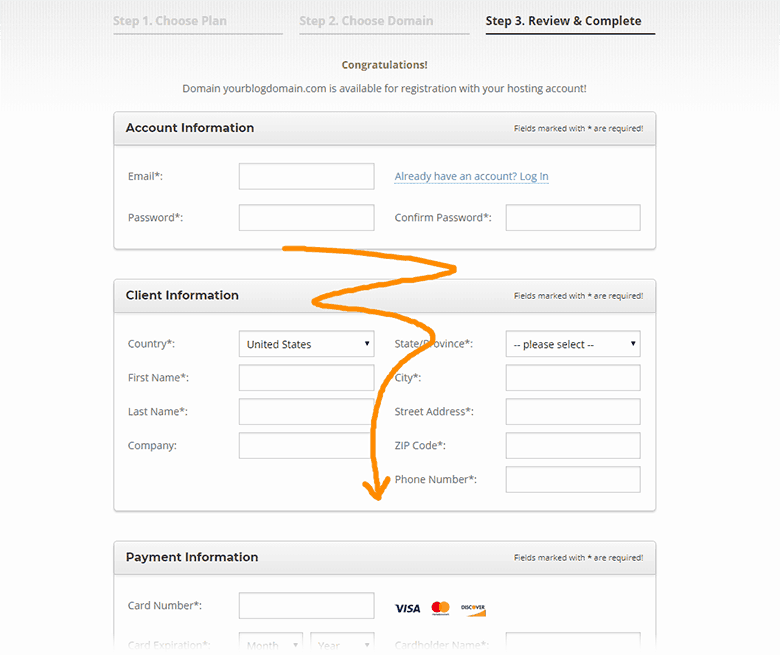 Once the SiteGround page opens, click SIGN UP. Next, choose a plan. For beginners, we recommend either the StartUp or GrowBig plans. The two plans are quite similar with a few exceptions. In particular, the starter plan allows only one website. Also, things like transferring your website and restoring from a backup are paid services (but free with GrowBig). We went with the GrowBig plan primarily because we host multiple websites. You can always upgrade your plan later but you’ll get the biggest discount on your initial order. 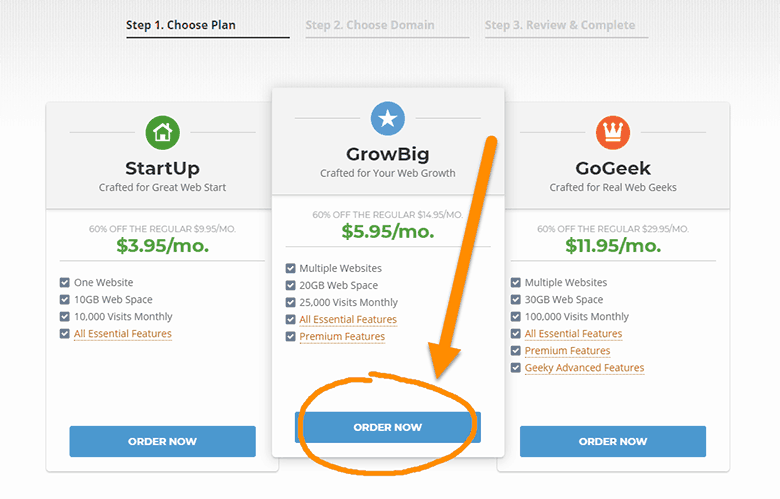 If you might want multiple blogs in the near future, consider purchasing the GrowBig plan now. Earlier in this guide, you came up with a domain name. Enter this domain name in the blank field. Make sure you’ve selected the right extension (.com, .co or .net). If you already have a domain name (registered with a different company), click the “I already have a Domain” option and enter your existing domain name. Period: SiteGround gives you a pretty nice discount on your initial 12-month order. Afterward, you’ll be billed on a monthly basis at their regular price. You can, however, extend this discount up to 36-months (your first three years) by changing the Period for this initial order. Domain Privacy: Every domain has a public record that shows who owns it and how to contact them. This opens the door to unwanted solicitations, spam and even identity theft. Domain Privacy is SiteGround’s service that will keep your personal information private and unavailable to the public. We highly recommend it! SG Site Scanner: Keeping your websites up and running is one of SiteGround’s priorities. The SG Site Scanner will monitor your account daily and check it for being hacked, infected with malware and domain blacklisting. If you want extra peace of mind, it’s worth considering at less than $2/month. After reviewing your options, click PAY NOW. Congratulations! You’ve just created your hosting account! In the next section, we’ll walk you through installing WordPress. 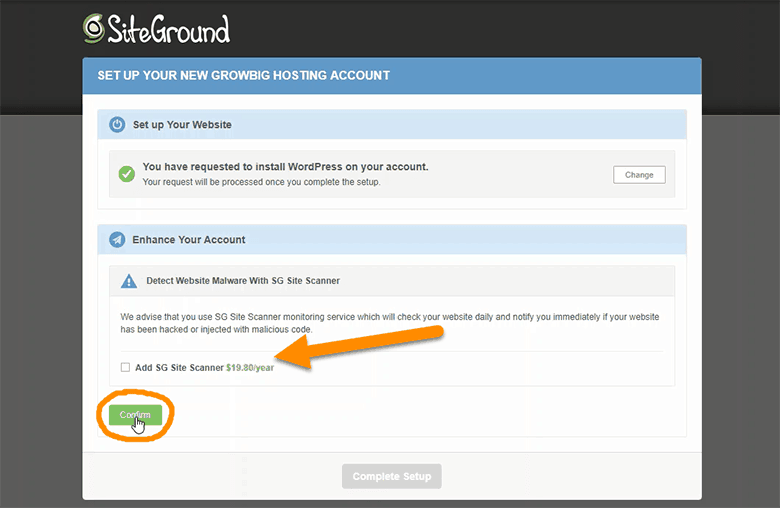 Don’t worry – SiteGround makes this super quick and easy. To get started, click PROCEED TO CUSTOMER AREA. Once upon a time… setting up a WordPress blog required: downloading the software, extracting it on your server, setting file permissions, creating a database and users, making some code changes and then tying it all together using an installation script. As you’ll soon see, the process is much more streamlined with SiteGround. Continuing from where we left off above – click Start a new website. 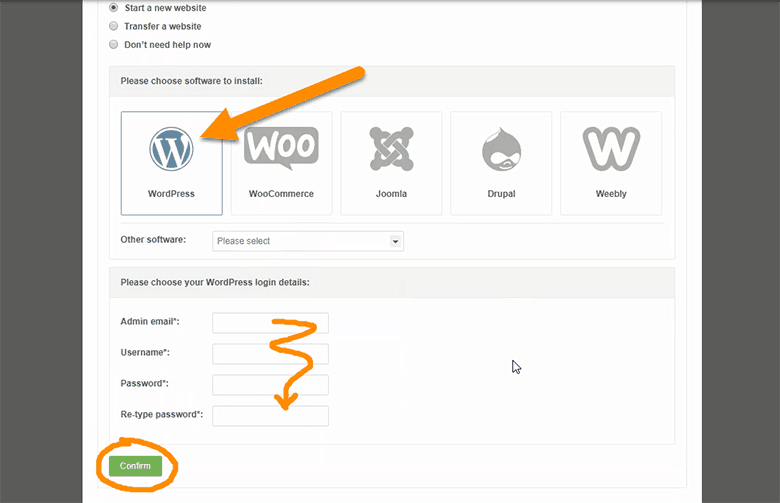 Next, click on WordPress and fill out your login details. Be sure to write these down because you’ll need them again when logging into your new WordPress website. If you didn’t select any account enhancements (such as SG Site Scanner), they’ll give you another chance to choose it. Check it or leave it unchecked – and then click CONFIRM. The final step is to click COMPETE SETUP. 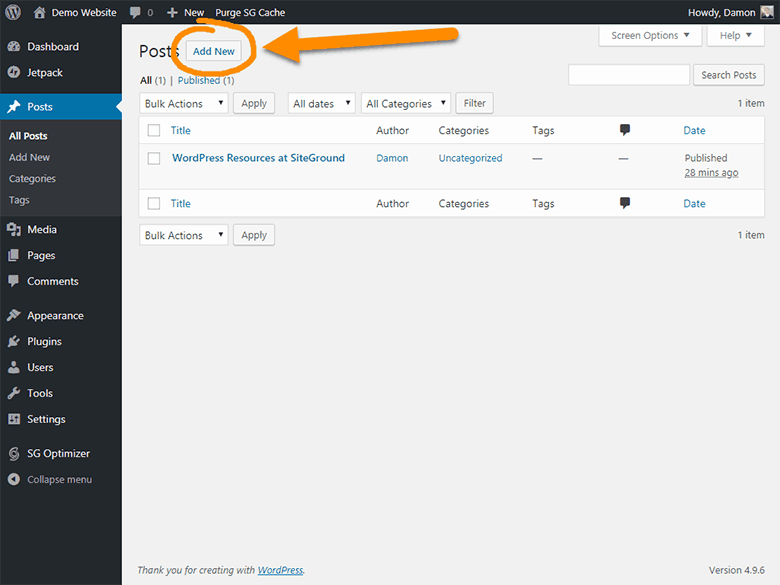 Your account setup is complete and WordPress has been installed! Great job!! 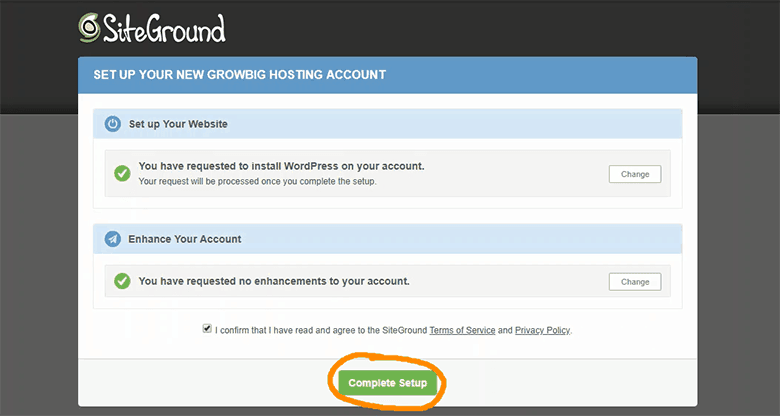 You should receive a setup confirmation email from SiteGround. It’ll have your website login details, including the Admin URL and username (that you came up with above). Keep this info nearby because you’ll use this when logging into your website. 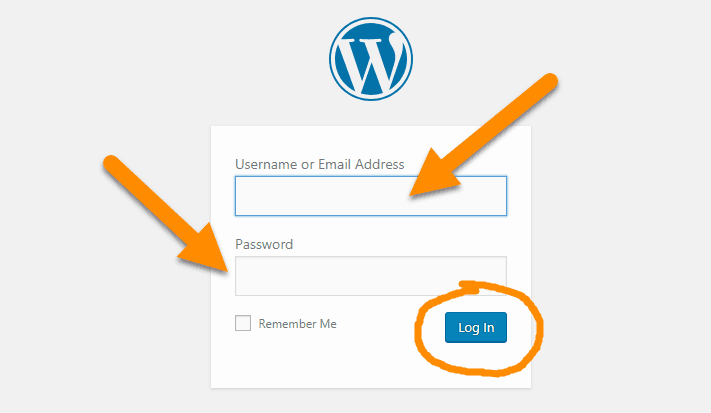 With WordPress, your Admin URL is always your domain name + ”wp-login.php”. We recommend bookmarking this address so you don’t have to type it each time. You’ve got a blog now! How awesome is that? Granted, there’s not a lot to see at the moment. But that’s easy enough to fix! In this section, we’ll make your new home look a little more inviting by making your first blog post! 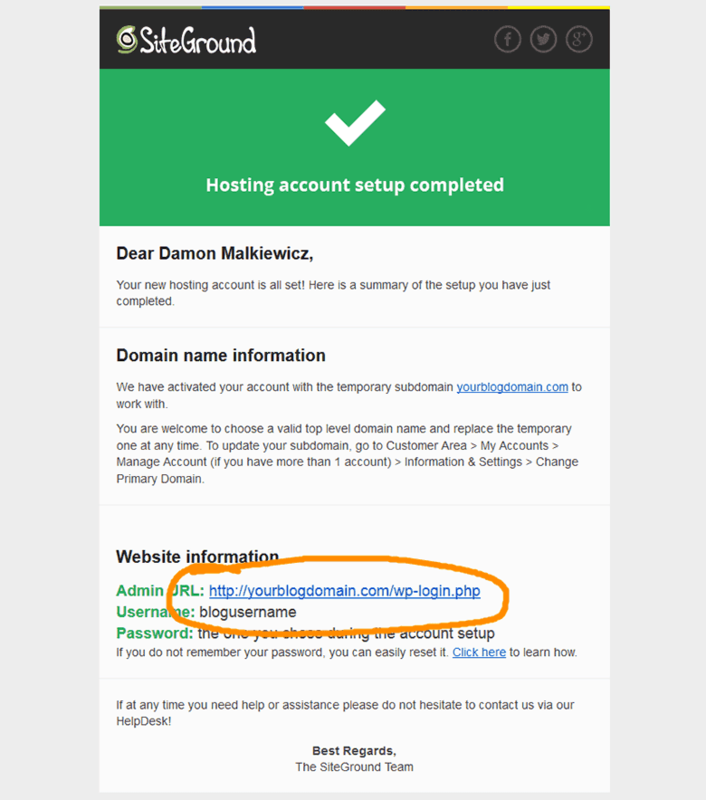 To start, go to your Admin URL (from previous step). You should see a login prompt like below. Enter your login details and click Log In. 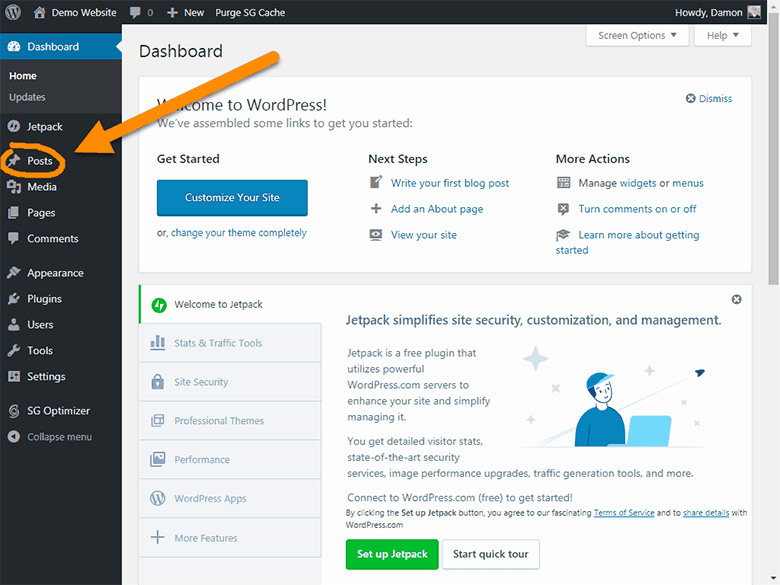 After logging in, you’ll see your WordPress dashboard. It should look something like the following picture. There’s a lot to look at on this screen. Don’t let it intimidate you! At the beginning here, we’ll just focus on what’s necessary for hitting your goal – making that first post. The rest can be learned over time. This is your Posts view. 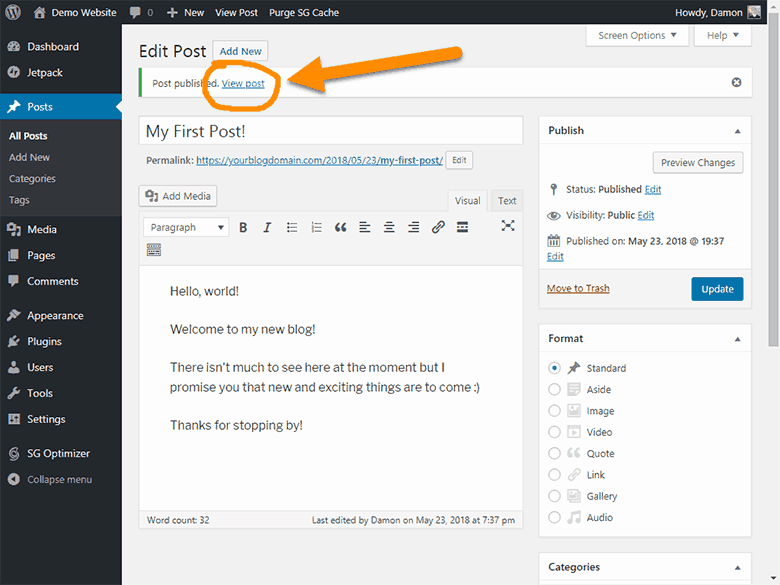 This is where you will come to add, edit or delete your blog posts. SiteGround creates a resources post during setup, so it’s normal to see something already here. This is where you will create your actual blog post. There’s some strategy to crafting a great blog post but that’s outside the scope of this article. For now, keep things simple and write something brief. For example, you could write an introduction. Let people know why you created this blog and what they can expect in the near future. Remember, this is just an exercise and you can always delete this post later. Easy peasy, right? You just published your first blog post for the world to see! To see what it looks like, click the View post link. If you’ve made it this far, then seriously… WELL DONE! You’ve just taken a huge step towards becoming your own boss, crafting your ideal life and starting your online business! Give yourself a pat on the back and take a break. When you come back, we’ll continue with Part 2 in this series on setting up a blog. Here we’ll walk you through 8 essential steps in configuring and customizing your new blog. This is where things start to get fun. We promise – you won’t want to miss it! We’re glad you took the time to read through this guide. The most important next step is to take action! Once again, we hope you learned a lot from this how-to guide. Feel free to let us know if you have any questions. Just post them in the comments below. We want to help. Leave a comment, let us know where you’re struggling.